I finished a single sock in Louet Gems yarn, which proved to be very nice to work with. It is a soft grey color and has a ribbed lace pattern from the fabulous Sensational Knitted Socks. I used size 3 circs Addi Turbos. My goal right now is to finish this pair for my SIL’s birthday. I have a month, so that is definitely doable provided I don’t get too distracted by other projects. Ha! If you know me, you know I always have several things going at once. 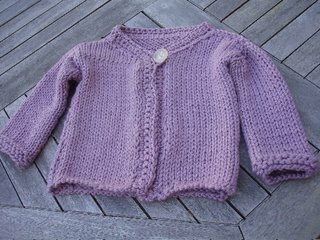 Last, but not least, is the cardigan sweater I have finished for Amelia. It is made from Debbie Bliss Cashmerino Superchunky. I love love love this yarn!! For one thing, it is very chunky so it’s a fast knit. It’s a very soft pale shade of lilac. It is very soft to the touch, and knits very evenly (on size 13s!). I didn’t really even use a pattern for this, just referred to some for sizing. It was hard to decide how to finish it, whether to do a crocheted border, or a ribbing or use a ribbon tie, etc. It did tend to curl up, so I tried to figure out what would be the best way to uncurl it. I had some novelty yarn that would make a nice border but it seemed to me it would be a waste of the beautiful Bliss yarn (an appropo name) to taint it with novelty yarn even if it did match. After some deliberation, I decided to single crochet around and add one large button. Amelia refuses to try it on today. Oh, to be almost 3 and in command! Pictures when I find the camera! 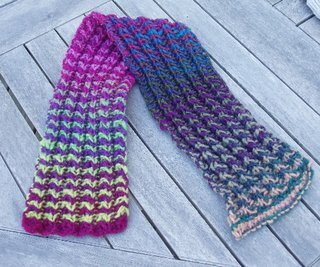 The colors in the scarf are beautiful! Beautiful FOs! I love the little lavender cardi. I’ve knit a couple Debbie Bliss designs, but I have never bought her yarn. It always seems pricey, but it sounds like it’s worth it, esp. if you’re knitting something little. Well, Jodi, this sweater only used 3+ balls of yarn, so I could afford that. I’ve knit a ton of the projects from Last Minute Knitted Gifts (also known in my house as the Bible). Isn’t that Noro scarf awesome? I made it for my daughter last Christmas. Glad you finally got the book! I love, love, love using the Gems Opal for socks!!!! Doesn’t it feel like the socks take no time at all to knit up? 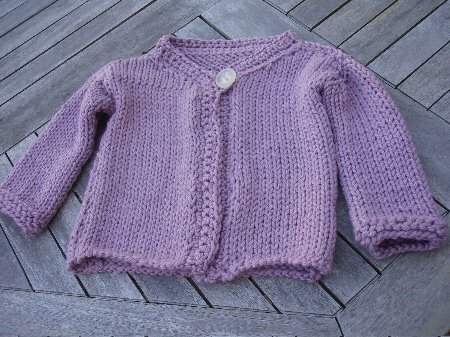 What a beautiful cardigan – lucky little girl you have!